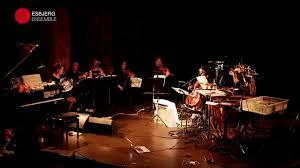 THE COASTLINE PIECE III: WEST is commissioned by Esbjerg Ensemble and Klangspuren Schwaz. World premiere: 27th September 2014, Klangspuren Schwaz, Austria. Further performances: 25th October 2014, Hofteatret, Wundergrund Festival, Copenhagen, Denmark. THE COASTLINE PIECE III: WEST is published by Edition Wilhelm Hansen. THE COASTLINE PIECE III: WEST follows on from THE COASTLINE PIECE I: THE PROJECTOR PIECE (2000), and THE COASTLINE PIECE II: INDIGO SEA AND SKY (2002). The first two coastline pieces were created in the context of a collaborative multi-media project, MAPS, in which a group of artists created two site-related productions in Melbourne and Copenhagen for audiences who became sonic wanderers within the performance-installations’ successive spaces. Within the MAPS project, the two coastline pieces evolved as instances of a kind of sonification of shores local to the two performance locations, seen in a larger perspective, and proposing correlations and gaps between cartography and musical notation. So, THE COASTLINE PIECE I (2000) presented an overview and details from the cartographic representation of the Victorian coastline in Australia, in varying scale formats, grafted onto 5-line staves, and THE COASTLINE PIECE II (2002) subjected a map of the outline of the Danish island Zealand to similar treatment. To give the audience a sense of these notations and let them in on the subtext, the musicians played from one-system scores scaled up to measure 5 metres from left to right and projected or drawn onto the venue walls, with travelling markers determining the pace of the music, so that musicians and audiences could read the same score at the same time. These pieces owed much to the tradition of sonification in mid-20th century experimental music such as Cage’s Atlas Eclipticalis (1961-2) and Solo for Voice 3 (1970), or Alvin Lucier’s Panorama (1993), although more by common cultural knowledge than by direct association. THE COASTLINE PIECE I was scored for violin, cello and contrabass recorder, and THE COASTLINE PIECE II was scored for the same forces, plus percussion (playing a pan of water and fishing-reel). THE COASTLINE PIECE III (2014) is more conventionally notated, for a larger amplified ensemble of 7 instruments, and involves field recordings that reference the sea and seashore sounds. 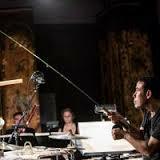 The percussion part lists a variety of ‘seashore objects’ alongside conventional percussion instruments, and one of the players triggers field-recordings via footpedal. The piece was commissioned by an ensemble with a firmly classical performance practice, and during composing I reflected explicitly on the tradition of classical programmatic sea music traced by works such as Debussy’s La Mer (1903-5), the Four Sea Interludes from Britten’s opera Peter Grimes (1945), Delius’ Sea Drift (1903-4) and Benedict Mason’s Lighthouses of England and Wales (1987). But also Natasha Barrett’s multi-channel electronic piece Trade Winds (2006) – a sea piece by other means - came to mind, during the editing and mastering of the audio samples. As usual with my many of my recent pieces, I found during the compositional process that having posed myself the task of aligning classical ensemble music with field recordings, I intuitively sought links between the field recording format’s opening to sound art as a less musical form of listening, and the potential role of percussion in reproducing naturalistic sounds with skills akin to those of the foley tradition. THE COASTLINE PIECE III piece wanders, therefore, between ambient, metred and ambiguous modes in which I hoped not only that the sonic resonance would vary artistically, but also that time would flow very differently in different sections. The choice of field recordings used in THE COASTLINE PIECE III stemmed from a conversation I had about western coastlines with the commissioning ensemble’s Norwegian manager Katrine Ganer Skaug. Pushing off from the paradox of a regional ensemble located far from the capital city yet peopled by international musicians, issues of cultural peripheries and cultural migration presented themselves quite quickly. Esbjerg is a seaport town on the west coast of Denmark, and in my biography, it is the town where I docked when I arrived in Denmark in 1993 to study composition with Per Nørgård and Hans Abrahamsen. The Esbjerg Ensemble is Denmark’s oldest chamber-music ensemble, and its long-running annual composers’ workshop has provided many Danish and other composers – myself included – with their first experiences of working closely with professional classical musicians. Numerous composers will remember the immersive experience of being greeted by a heady mix of fishy and beery smells while walking nervously to and from the first professional rehearsals of their career. Esbjerg is not particularly remote, but Katrine Ganer Skaug reminded me that coastal communities in even more remote areas are often socially and materially isolated. Scandinavian novels such as Hans Kirk’s Fiskerne (1928), describing a west-coast religious Inner Mission community in Denmark, or Jon Fosse’s Morgon og kveld (2000-1), in which a fisherman’s transition to from old age to death is described in part as a journey at sea in his fishing boat, document how far removed the lives in fishing communities can be from modern social contexts, and how close themes of religious transcendence are to everyday life in these elements. In the days when I was writing the piece, in July 2014, the Gaza coastal strip was constantly in the news. The latest Palestinian crisis has brought a new and desperately topical perspective to the classic themes of isolation and survival in fishing communities, and also to related concerns of religion and national identity, stripped in this case of all Scandinavian romanticism and sentimentality. I spent many hours trawling through YouTube footage of Palestinian fishermen negotiating the discrepancy between the 1993 Oslo Accord’s provision of a 20 nautical mile fishing limit and Israel’s latest clampdown in unilaterally enforcing a 3 nautical mile fishing limit on Palestinian fishermen. The fishing limit has been the subject of many conflicts and provisional agreements over recent years, as the size and quantity of fish able to be caught off the Gazan coast depends crucially on distance from the shore, with sardines – the Palestinians’ main market fish - typically caught 5 to 8 miles offshore. The loss of catch represented by these territorial restrictions has been estimated at over 7000 metric tons over a five-year period, equating to nearly US$ 30 million. Fishing boats crossing the line are subjected to water cannons, live fire or the ‘swimming procedure’, by which fishermen are required to undress, leave their boat, and swim to an Israeli navy boat where they are arrested and taken ashore for interrogation while their boats are confiscated. Understanding this context, the videos on the internet made a great impression on me, jerking the imaginary world of my piece away from its artistic reflection on nature as a purely romantic object of contemplation. Finally, I felt that in pursuing my commitment to making works with one foot in abstract concert music and the other in extra-musical parameters, I had to involve both musically and politically charged sonic material in THE COASTLINE PIECE III. The Coastline Piece III: West is commissioned by Esbjerg Ensemble and Klangspuren Schwaz for performances at Vadehavs Festival (Esbjerg), Klangspuren (Schwaz, Austria) and Wundergrund Festival (Copenhagen), during September and October 2014. The Coastline Piece III: West is published by Edition Wilhelm Hansen.